“Born on 1 Jan., 1878, Paul Payan’s exceptional facility in his low notes was apparent from the time his voice broke. He pursued his musical studies at the Paris conservatoire in the class of Isnardon for opéra comique and of Melchissédec for opéra. After winning prizes, he was engaged by Albert Carré for the Opéra Comique where he made his début in the role of the first philosopher in Charpentier’s LOUISE. As a member of a particularly distinguished company, he made a long career in secondary roles, including around twenty creations, but also the major roles for ‘basse noble’, including the Commendatore in DON GIOVANNI, Sarastro in LA FLÛTE ENCHANTÉE, Lothario in MIGNON, etc. With his impressive low notes he achieved notable successes in the provinces. He sang abroad on several occasions – at the Chicago Opera 1921-2, the Colón in Buenos Aires in 1924 and at Covent Garden in 1928-9. He ended his career teaching in Paris and died on 1 Nov., 1959 at Juan les Pins. 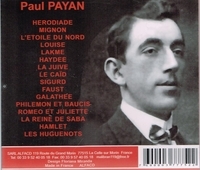 “Paul Payan attended the Paris Conservatory from 1904–1906. There, he studied with Jacques Isnardon (l’Opéra-Comique), Léon Melchissédec (l’Opera) and Auguste de Martini (singing). Albert Carré, Director of l’Opéra-Comique, engaged Payan and he made his début there on 6 September 1907 as the First Philosopher in LOUISE. His lengthy career at the Comique encompassed dozens of secondary rôles including 16 creations. Less regularly, he appeared in important rôles such as Sarastro (DIE ZAUBERFLÖTE), Lothario (MIGNON), Vulcain (PHILÉMON ET BAUCIS), and Basilio (IL BARBIERE DI SIVIGLIA). Payan also sang at many French prvincial opera houses where he had great success. His work outside of France included the Chicago Opera (1921–1922), the Colón (1924), and Covent Garden (1928–1929). His extensive discography includes acoustic recordings for French HMV, Aerophone, Perfectaphone, and Odéon; nine four-minute Edison cylinders; and 16 electric sides for French Odéon.